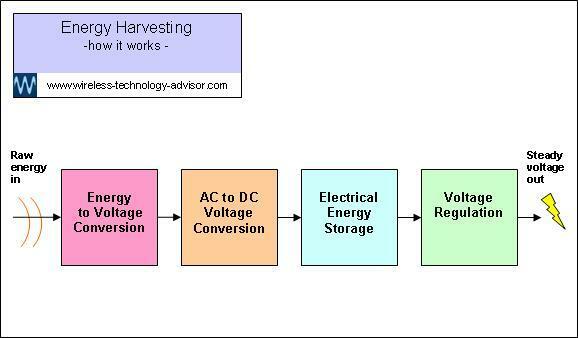 The question how does wireless technology work is easily answered. What types of information are there? A TV remote controller sends control command information to your TV, commanding it to go to the sports channel, or turn the sound up. A remote garage door controller sends control command information to a garage door, commanding it to open or close. A wireless sound system sends audio information (music or TV sound) to your wireless headphones or speakers. 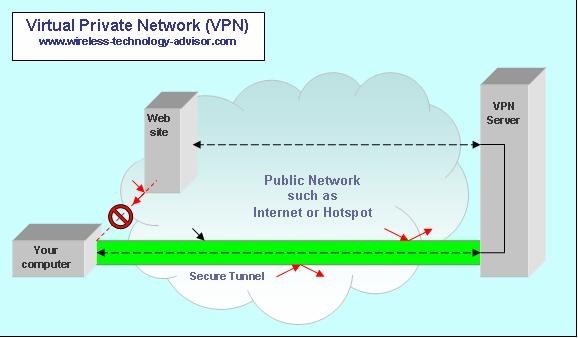 A wireless network-connected laptop computer sends and receives packets of complex data, allowing it to talk to other computers on the network. A cellular phone system routes packets of telecommunications information simultaneously on many channels in vast quantities. Information may travel in one direction or in both directions...from A to B and from B to A. This is where two wireless devices talk to each other in a two-way conversation. But whatever the nature or complexity of the information, it needs that something to carry it. because it can be radiated and be made to pass through space, air and some solid objects. And best of all, it still works when that one place is moving relative to the other. And while these have separate names, this is just for our convenience...they’re just different parts of the same thing, the continuous electromagnetic spectrum. So what type of electromagnetic energy do the examples above use? TV remote controllers mostly use Infra-red light energy to carry, or send the information from the remote in your hand to the TV. We can’t see Infra-red light, because it’s not in the visible part of the spectrum. When you push a button on your remote, an Infra-red light emitter starts flashing rapidly, perhaps thousands of times a second, to send a coded signal to a special receiver in your TV. The receiver sees the light, decodes the flashes, reproduces the command then carries it out. These work well in a room in line-of-site of the TV, but wouldn’t work at all if there were a wall in the way. 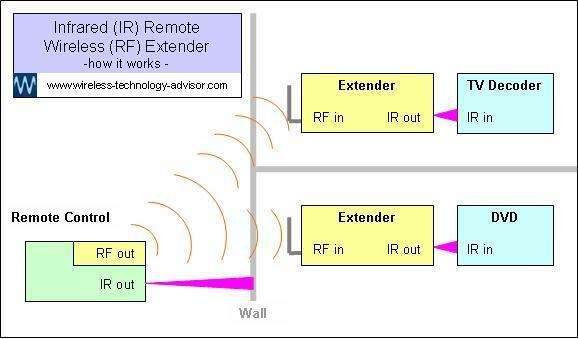 Remote garage door controllers use Radio Frequency waves (usually just called RF). This type of energy can usually penetrate glass windows, walls and other non-metallic objects. The command information is superimposed on the radio signal and when the garage door receiver detects some of this RF energy, it decodes the information from it, and carries out the command. The cellular phone system uses Microwaves because it needs to carry such a vast amount of information that it needs an extra-broadband carrier and Microwaves can carry this big load. Like the Infra-red beam from the TV remote, the microwave transmitter and receiver work best in line-of-sight with no objects in between. Cellular systems are increasingly being used to access the Internet. High speed, anytime, anywhere Internet access is becoming a reality. How Does Wireless Internet Work? 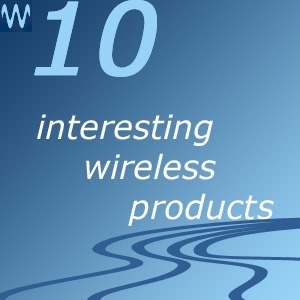 Want some examples of how wireless technology is applied to various products? There may be more than you think. Discover types of wireless technology and applications that you may not know about. The door is open, and new products and opportunities are emerging all the time. How do we create a definition of wireless technology? It's simpler than you may think, and by broadening it beyond the common understanding, we can really extend the boundaries and gain traction on a technology that's good to go. Understanding wireless technology trends allows you to position yourself and ride the coming wave of change... the tide is already rising. Maybe you want to be one of the first to try the latest products, or perhaps you have a business idea you want to try, or want to take a strategic lead in a potential opportunity offered by a new product group or application...or maybe you just love finding out about new technology. Come and ride the leading edge without getting out of your depth. Can be complex and hard to get to understand in a reasonable length of time and is often scattered in many places, making it difficult to access. An aim of this page and the website is to provide easy-to-understand information in one place and to deepen your understanding of the how does wireless technology work in a particular topic, when you need it.